Scarlett Luchsinger: My name is Scarlett Luchsinger. I am twenty-two and I am an aspiring photographer. My home is Miami, Florida, where there is sunshine year-round and the beach is never far away! At the age of sixteen, I received a flat iron for the first time. I thought that it would fix all my hair issues. 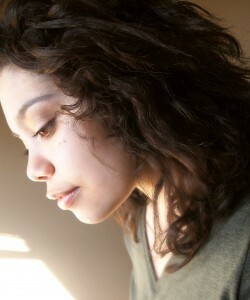 I flat ironed my hair for about six years and during that time, I never wore it down and curly. I also dyed my hair 4-5 times. My hair began to break off, literally. It was extremely dry, dull and lifeless. I began to research going natural and I came across the words "Curly Girl Method." I found the solution to my problems! SL: My hair loves moisture and thick, creamy products. I co-wash daily with a light conditioner and use a heavier, more moisturizing conditioner for the length of my hair. Then I use my fingers or a wide-tooth comb to detangle. I pat-dry my hair with a microfiber towel or an old t-shirt and when it's no longer dripping, I apply my styling products...a leave-in conditioner, a hair cream and mousse. I let my hair air-dry and try not to touch my curls until they are fully try. I also use a sulfate-free shampoo about once every 1-2 weeks and I use coconut oil once every 2 weeks. SL: I must have Matrix Biolage Conditioning Balm, a rich and moisturizing conditioner. It is my holy grail and I have not been able to find anything else that works as great! My hair is so dry and frizzes easily, but this product helps to tame and moisturize my hair. Another must-have is SheaMoisture Coconut & Hibiscus Curl Enhancing Smoothie. It is very thick and moisturizing...and overall it works great on my hair! 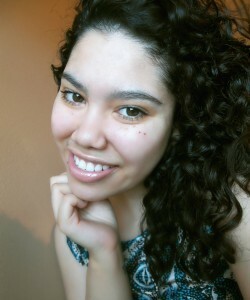 SL: In early 2013, researched the Curly Girl Method thoroughly and I immediately stopped using sulfates and silicones. 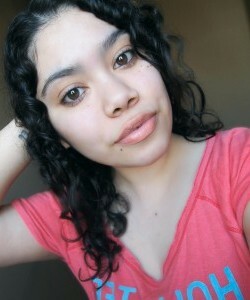 I also gave up flat ironing my hair and decided to go all-natural and embrace what I was given! NC: What reaction did you get when you decided to go natural? SL: Most of my friends didn't know that I had curly hair! I got a lot of compliments and glances. My husband cheered me on and was very glad that the natural curls stayed for good. It felt great and I was excited to see my curly hair's potential. SL: No one has my exact curl pattern and no one ever will! It's unique to me and I've learned to love and appreciate that. SL: Curly hair is BEAUTIFUL and everyone can achieve that!